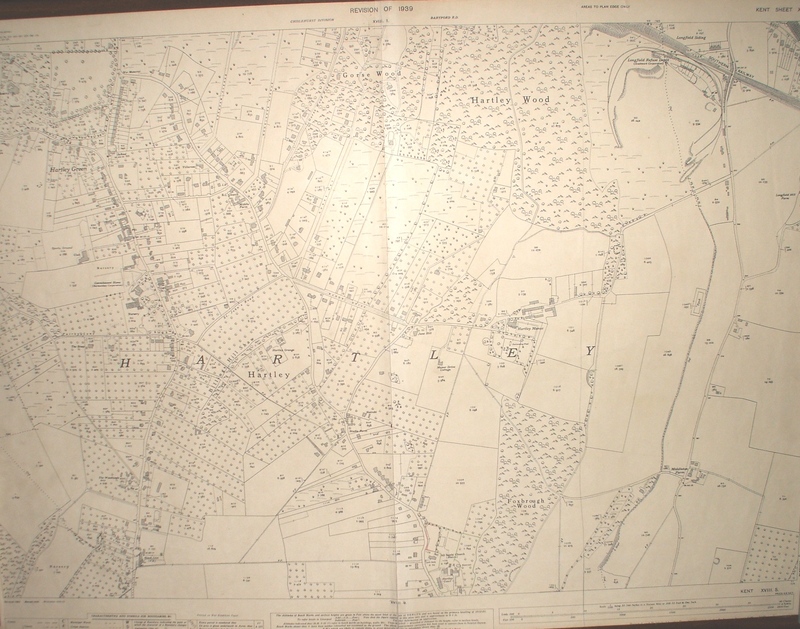 Maps are very important for local history, as the development of an area can be seen over time. 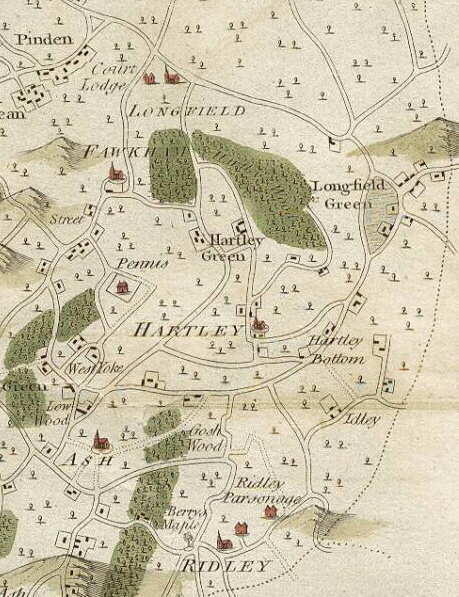 This article contains links to some of the maps available for Hartley from the first detailed edition in 1769. 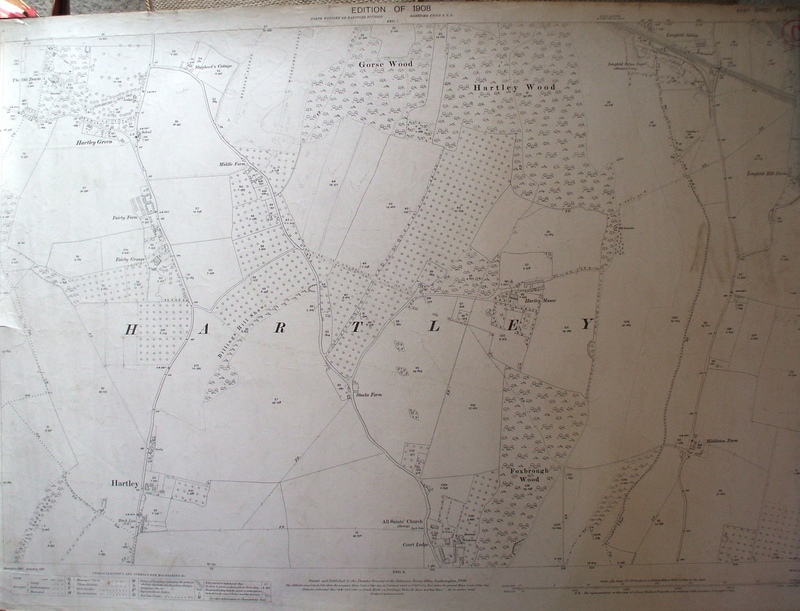 This is the first large scale map (2 inches to one mile) to show Hartley, which was included in Hasted's History of Kent in 1797. It was drawn by Andrews, Drury and Herbert in 1769 at a scale of 2 inches to the mile. They produced maps for each hundred (administrative unit). 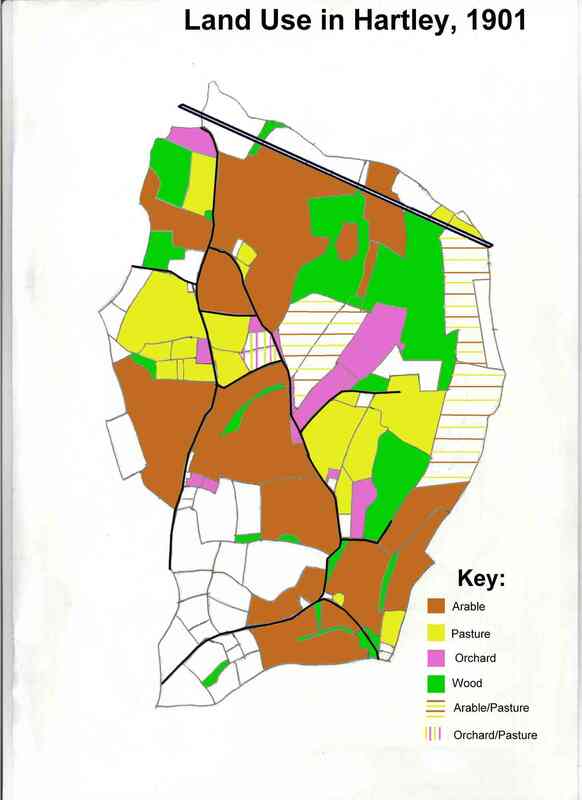 The picture on the left is an extract of their map for Axstane Hundred - roughly equivalent to the later Dartford Rural District Council. The detail is astounding, but they did miss a few houses (eg. Brickend, Woodins, New House Farm and the Black Lion) and Hartley Wood is probably larger than it should be, but this in no way should detract from the mapmakers' great achievement. The picture we get is one that is that that had existed from the 1600s. The only roads were Ash Road, Church Road, Castle Hill, St Johns Lane, Manor Lane, Grange Lane, Hartley Hill and Hartley Bottom Road. Most of the houses are faithfully reproduced, for example in Manor Lane leading from Stocks Farm you can see Hartley Wood Corner and Hartley Manor. 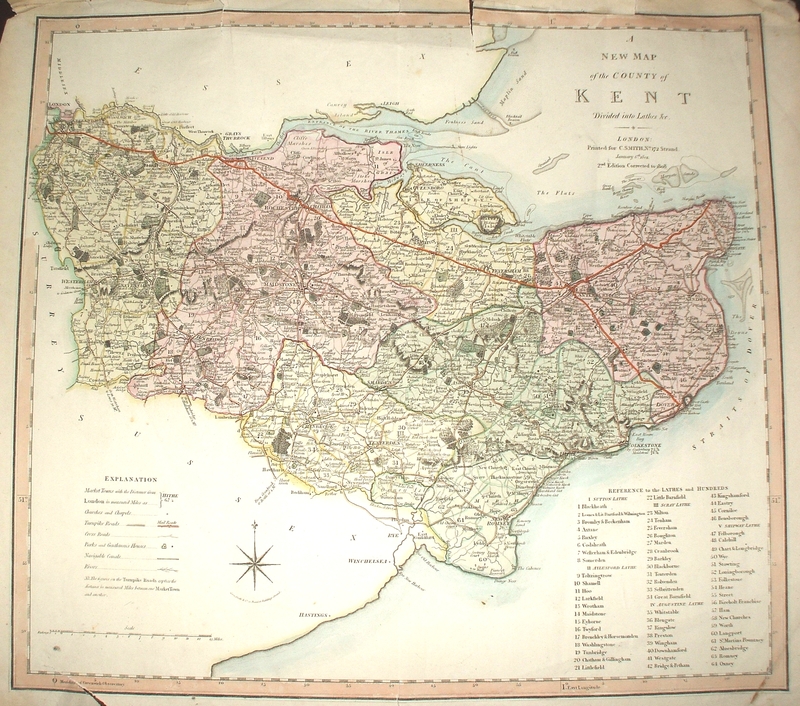 Kent was the first county to be surveyed by the new ordnance survey. The original survey is kept in the British Library. It is on a scale of 3 inches to one mile, survey lines radiate from Hartley Church to the churches of Ash, Longfield, Ridley and Horton Kirby. The scale is such that the pond by Manor Field can be seen, as well as all the houses that existed then. To see the original, follow the link to the page on the British Library website. The copyright is owned by the library. 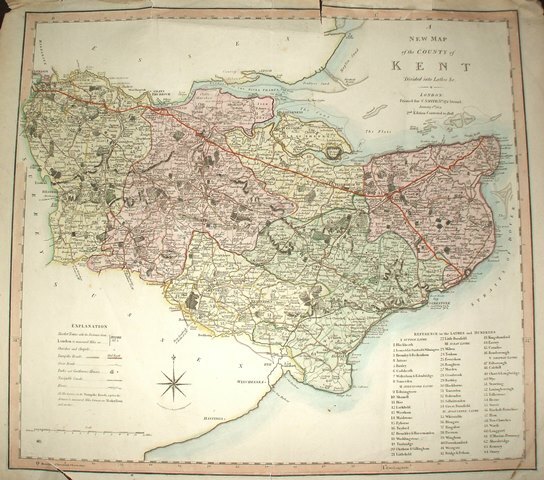 This wonderfully detailed map of Kent was published by C Smith of 172 Strand, London in 1808. Then of course the county extended as far as Deptford. The north-western part of the county coloured yellow is Sutton at Hone lathe - the most ancient administrative area, within this Hartley, Longfield and Ash fall in the area edged yellow and numbered 4 - Axton Hundred. The turnpike (toll) roads are shown in yellow, for example from Dartford to Farningham, while the main turnpike roads on which the Mail coaches also ran are shown red - the future A2 is clearly visible as one of these. It is not altogether accurate for settlements - the houses marked only show the general location), and 1769 map is better for minor roads. But it is a powerful representation of a settlement pattern that would have changed little from the middle ages. This map was clearly influential for years to come, another map, published by G Virtue of 26 Ivy Lane in 1833 is very similar. The bolder roads are the main turnpike (toll) roads, with the distance from London being inserted in italics. The dotted line running to the east of Hartley is the border of Sutton at Hone lathe - one of the most ancient administrative area. The 1 represents Axton Hundred - a sub-administrative area. Other hundreds are Dartford and Willmington (5) and Toltingtrough (17). The first published (the 1795 survey was mapped at 6" but published at 1" scale) Ordnance Survey large scale map of Kent at 6 inches to the mile. The Old Rectory (built in 1851), Bests Cottages (1858) and some but not all of the cottages in Castle Hill (1864) are recent additions. 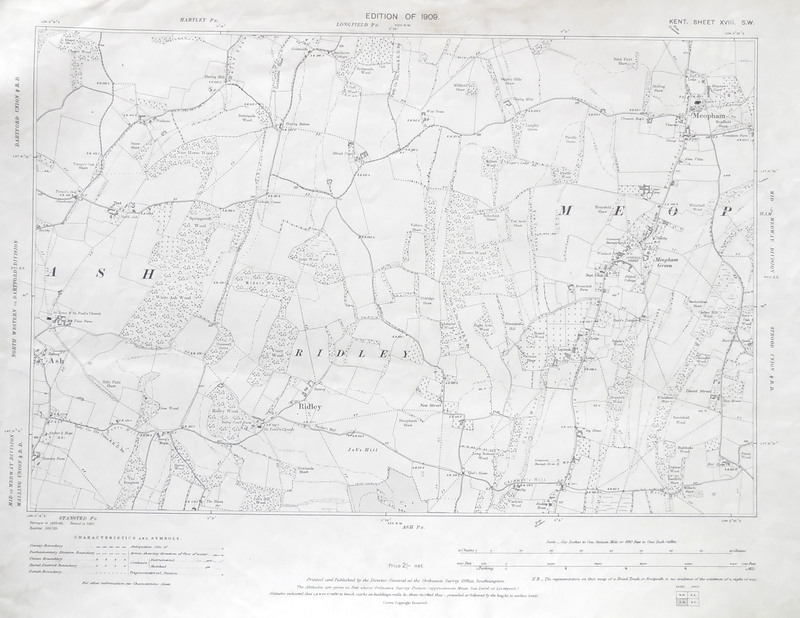 Ordnance Survey 1 inch map of Hartley area, including Horton Kirby to Harvel and Southfleet to West Kingsdown (seal at top of map is dated March 1893). Although dated 1893 it is actually based on the 1819 survey of Kent by Colonel Mudge, with an update for the railways in 1887. This means that some information is out of date eg. Hartley Bottom Farm is shown as the King's Arms which ceased to be a pub in 1872, and Old Downs and its outbuildings (built 1879-87) are not to be found. 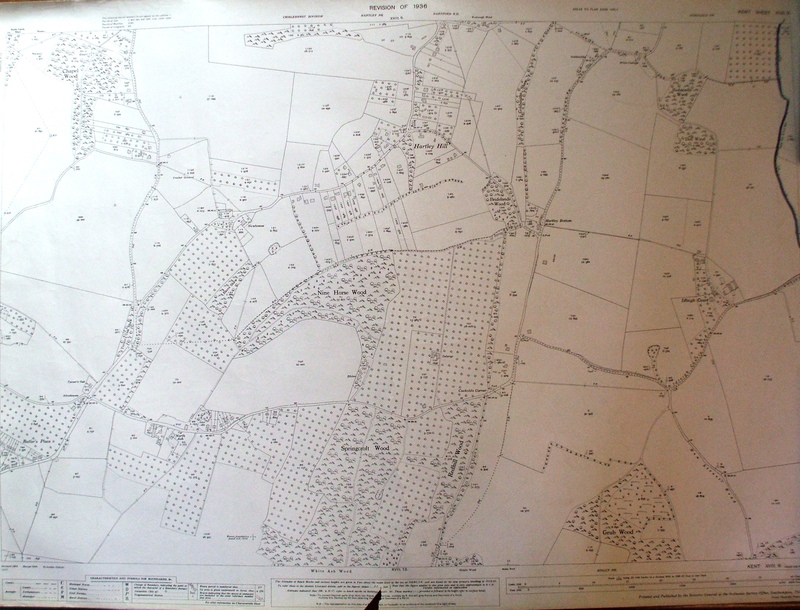 In 1901 the Hartley Manor estate was put up for sale and this map (based on the Ordnance Survey map) was produced to go with the sale brochure. Most of the land in Hartley belonged to the estate, the only significant exceptions were New House Farm, Hottsfield and Old Downs. It is one of the few maps to record the shortlived Best's Cottages at the Church Road end of St John's Lane, which were demolished a couple of years later. The schedule which accompanies it allows us to build up a land use map. The 1908 map is really a milestone in Hartley's history. 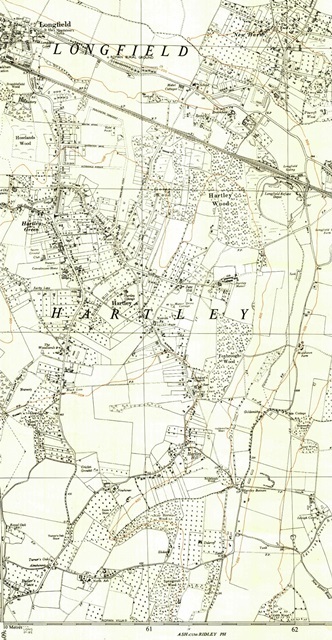 This 25 inches to 1 mile large scale map shows Hartley on the eve of the developments which would transform the village forever. But the beginnings of the future are there to be seen as the ghostly outlines of Woodland Avenue, Wellfield, Gresham Avenue, Merton Avenue and Larksfield are to be seen. 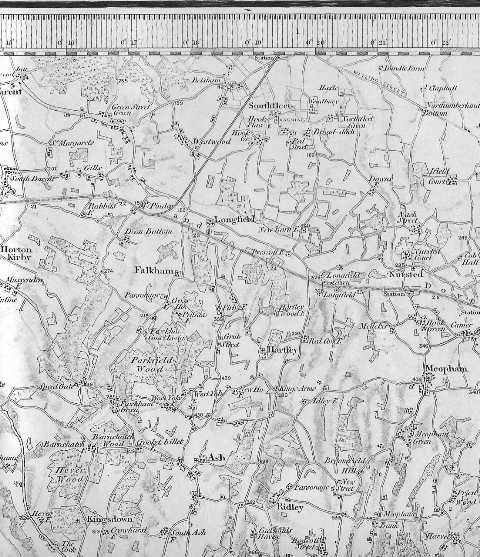 A smaller 6 inch to 1 mile map of the area followed in 1909. This map includes the south part of Hartley with Ash, Ridley and Meopham. 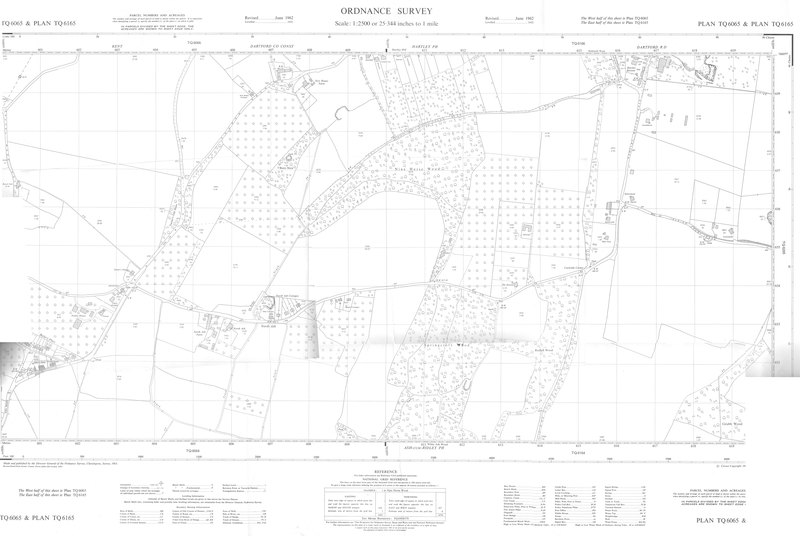 Shortly after in 1914, the Ordnance Survey published a new one inch to one mile map. Although based on the 1908 map, it contains new information, such as the first houses built by Smallowners. Most of the land advertised for sale in 1901 came into the hands of Small Owners Limited in 1912-13. 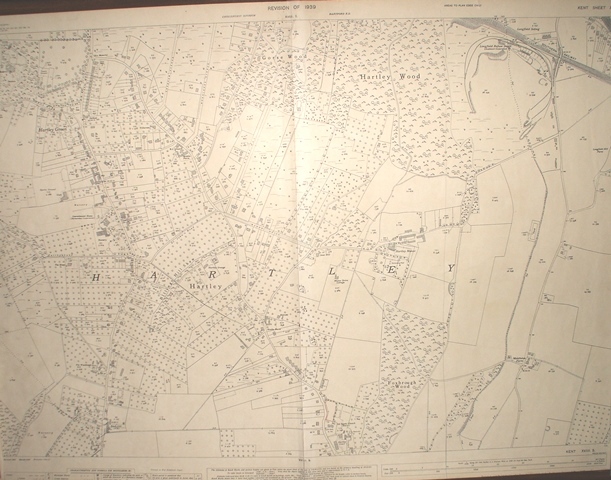 This is a copy of an estate map which would probably have been displayed in their offices near where the Post Office is today. The date of this plan is uncertain; sold plots are no longer numbered, and it shows some of the first houses built by their purchasers. Next to plot 5, the name "Strawson" has been penciled in and he bought his plot in 1913. 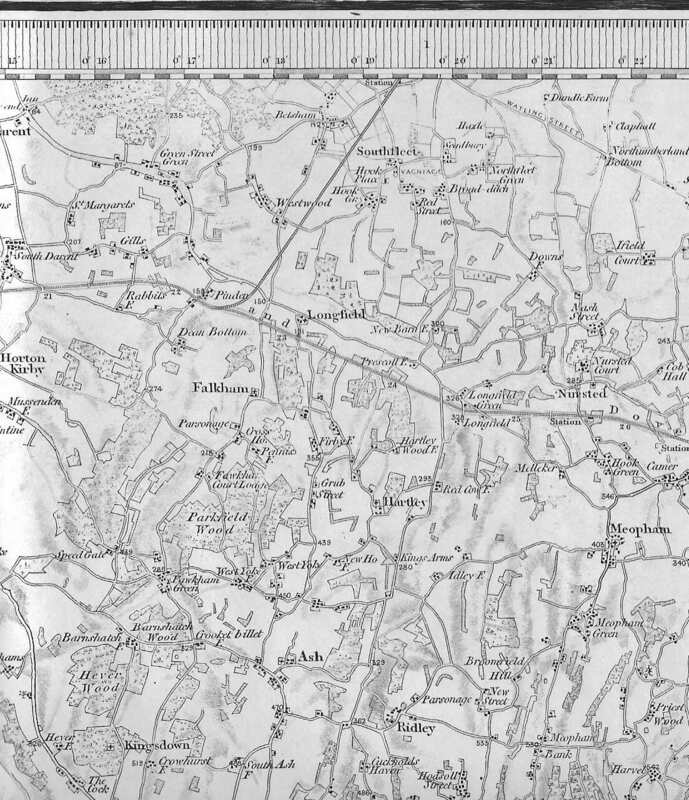 This is the 25 inch to one mile scale map that followed the previous edition in 1908. Naturally there have been many changes, but some lie in the future. 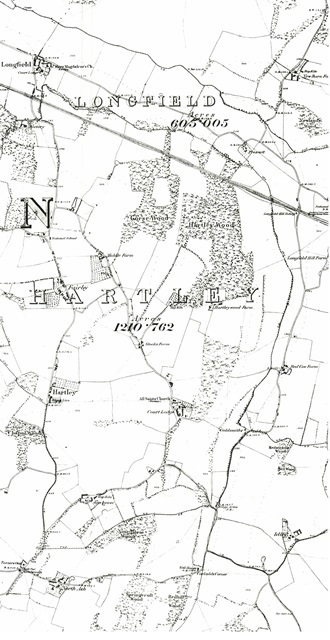 Hartley has clearly changed greatly in the wake of the land being parcelled out into smallholdings. 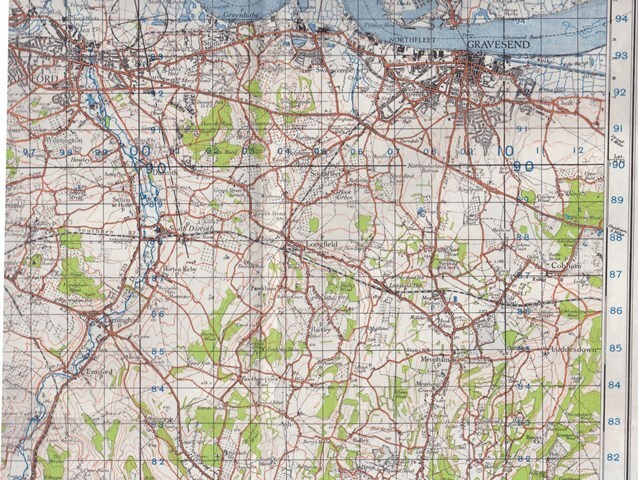 As before, a six inch to one mile map followed in 1938-1939. This covered most of Hartley. One new addition was the 1 kilometre gridlines of the National Grid, a familiar way to refer to map locations now, but an innovation in 1936. Just after the war came a new edition of the 1 inch to 1 mile map in 1946. This is very similar to the other one inch maps of about this date. Its importance is in the grid references. The military used a different map reference system called the Cassini Grid. This was because the national grid, which was supposed to replace it, had not been fully rolled out. Thus in order to interpret registers of where bombs landed, reference to this series of maps is necessary. This is a 6 inch to one mile scale map which contains information up to 1955. It includes many of Hartley's early post-war houses, for example the new council housing at Hoselands View, Larksfield (Silverdale Avenue) and Wellfield (Haverstock Drive. 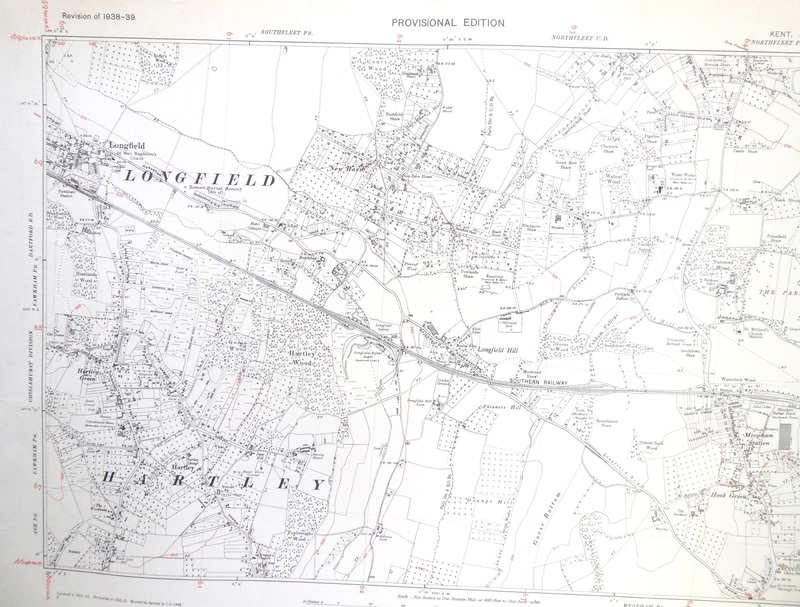 The houses added since the previous 1930s edition of the map are shown unshaded, for example Perran (since demolished, number 20 Wellfield), which was built in 1951. As well as new houses, another important change is the parish boundary. 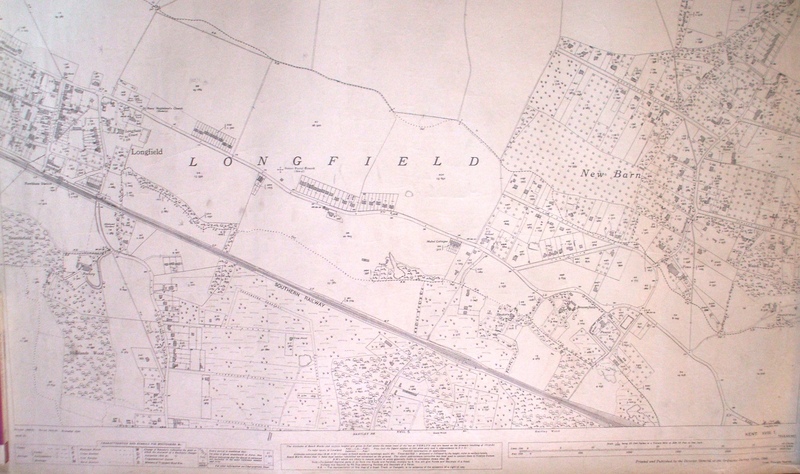 The boundary with Longfield has been moved to the railway, while a number of properties at the end of Ash Road have come to Hartley from Ash. The detail is just too soon to show the first major developments after the war, at Old Downs, Green Way and Springcroft. 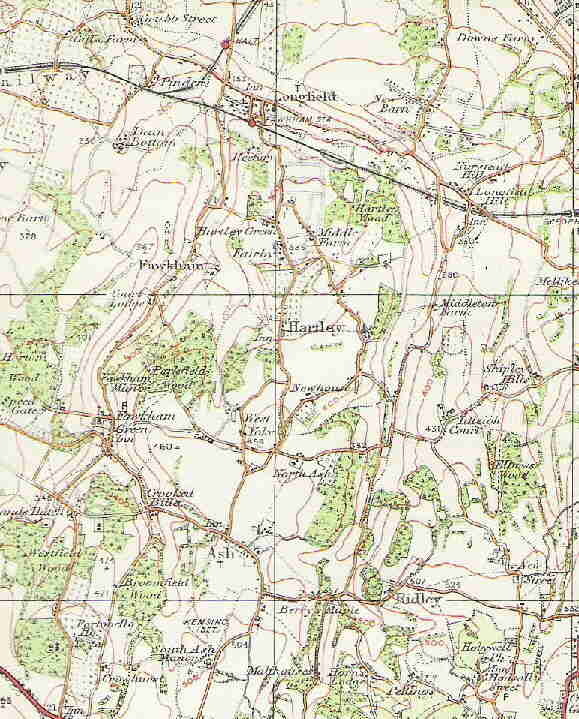 This is a map of the southern tip of Hartley and the northern part of Ash in 1963. This was a momentous year for the land in this map, for in this year New Ash Green received planning permission. 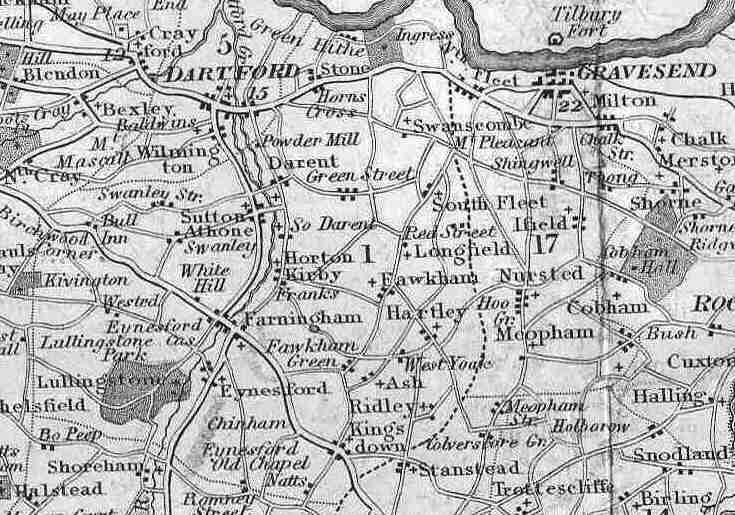 Within a decade much of the land in this map lay under the new estates of New Ash Green, including all those in the extract of New House Farm and Cottages above. I've scanned the map on my A4 sized scanner and then joined the pieces together, however there are a few places where an exact join was not possible.